Porridge is a dish made by boiling oats (rolled, crushed, or steel cut) or sometimes another cereal in water, milk, or both. It is usually served in a bowl or dish. Other grain meals boiled in water, such as cornmeal, may also be described as porridge, but more frequently have other names, such as polenta or grits. Oat and semolina porridge are the most popular varieties in many countries. In addition to oats, cereal meals used for porridge include rice, wheat, barley, and corn. Legumes such as peasemeal can also be used to make porridge. Gruel is similar to porridge but is much more like a drink; it has a very thin consistency and is made with water. It was served in Victorian workhouses as standard meals. 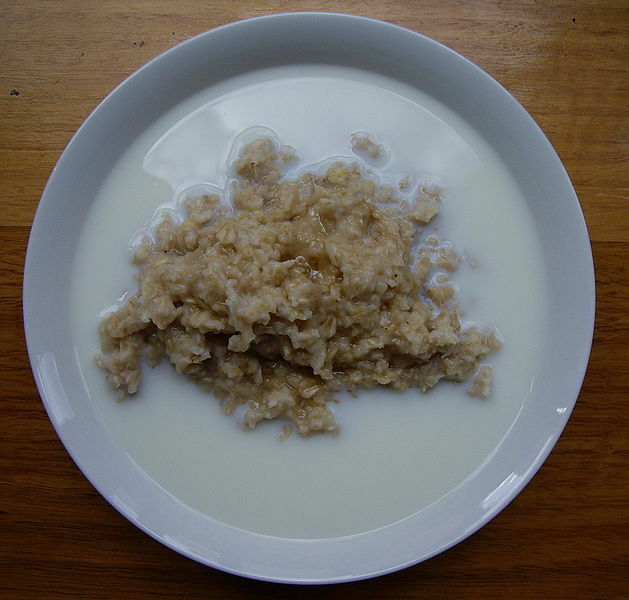 Porridge was a traditional food in much of Northern Europe back to antiquity. Barley was a common grain used, though other grains and yellow peas could be used, depending on local conditions. It was primarily a savory dish, with a variety of meats, root crops, vegetables, and herbs added for flavor. Porridge could be cooked in a large metal kettle over hot coals, or heated in a cheaper earthenware container by adding hot stones until boiling-hot. Until leavened bread and baking ovens became commonplace in Europe, porridge was a typical means of preparing cereal crops for the table. In many modern cultures, porridge is eaten as a breakfast dish, often with the addition of salt, sugar, milk or cream. As the traditional breakfast of Scotland, it is made with salt. Some manufacturers of breakfast cereal sell ready-made versions. Porridge is one of the easiest ways to digest grains or legumes, and is used traditionally in many cultures as a food to nurse the sick back to health. It is also commonly eaten by athletes training for their events.